Signe Benjamin, Samantha Look, Jeremy Houser, Nina Carter-Hitchen. Many of the shoppers in downtown Vineyard Haven on Sunday sported the same bags. They hadn’t all been to the same shop, but had all stopped by the same booth. 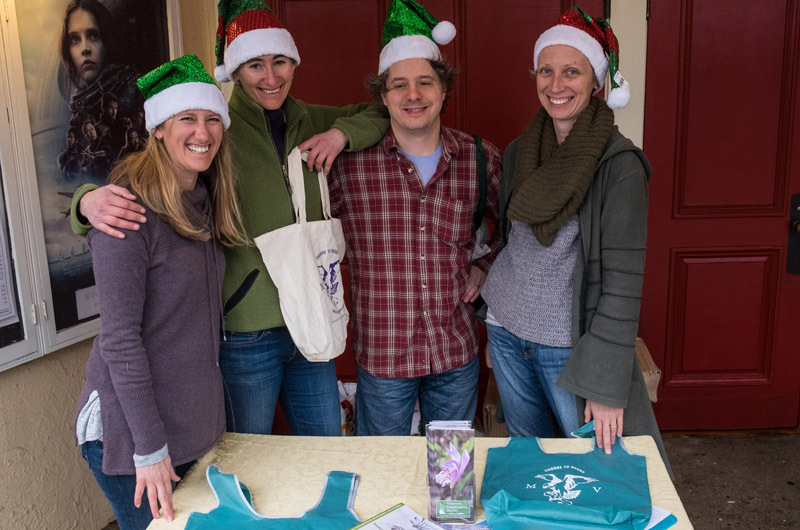 Tucked under the eaves of the Capawock theatre, Samantha Look, Signe Benjamin, Sophie Abrams and Nina Hitchen passed out two types of reusable bags to shoppers. They were there representing the Vineyard Conservation Society and spreading awareness about reusable bags as a ban on single use plastic bags is about to begin. Twenty-two businesses along Main street participated by offering BYO-baggers, a sweet treat or donating a dollar to Family to Family for every reusable bag used. Five of the six Vineyard towns voted at their annual town meetings to ban single use plastic bags as well as require paper bags to be made of post-consumer material beginning on Jan. 1, 2017. Oak Bluffs was the only town that did not consider the ballot question after selectmen pulled it from the warrant. Aquinnah, Chilmark, Edgartown, Tisbury and West Tisbury voted for the ban by a strong majority. A statewide ban is under consideration. Currently over 40 towns in Massachusetts have a bag ban approved or pending approval. The ban in the five Vineyard towns requires stores to offer only recyclable paper bags or reusable bags in their checkout lines. To qualify as reusable, a bag needs to have handles and be at least four one-thousandths of an inch thick. Though many people think to bring their reusable bags to the grocery store, Ms. Look said that the ban also affects retail stores and restaurants serving to-go food. Ms. Look now has separate bags for food shopping and retail, keeping the onion skins away from less pungent purchases. She emphasized that the burden of a plastic bag ban should be shared by the consumers. “As a consumer we think of plastic bags as such an incidental thing,” she said. “It’s a big impact we could have. For consumers, it’s so possible once you get in the habit of it to bring a reusable bag.” Though VCS spearheaded the ban and drafted the legislation, it’s the town health agents that have been working with businesses to implement the ban. In Edgartown, town health agent Matthew Poole said the transition will be gradual. Up to five businesses so far have been granted one year extensions to use up existing stock of non-compliant bags. Existing stock is a big issue, especially for smaller businesses that do not go through hundreds of bags a day and bought in bulk before the ban was suggested. Both Mr. Poole and VCS agree that using the non-compliant bags is a more economical and ecological choice than just throwing them away. Under the bylaws, paper bags offered by businesses must be 100 per cent recyclable and contain at least 40 per cent post-consumer recycled content (bags eight pounds and under must have at least 20 per cent). They must also be stamped with the word recyclable and the percentage of post-consumer recycled content. From his observations, Mr. Poole said the start date for the ban may have arrived too quickly. The Edgartown Board of Trade has been working with Mr. Poole to ease the transition for the business community. The board of trade represents 140 Edgartown businesses. President Sydney Mullen said while the businesses are trying to comply, the ban can have unexpected side effects. “Sometimes bags are a big part of branding, so not having those bags walking around town can be difficult for businesses,” she said. She also noticed a consensus in the business community that the plastic bags and paper bags should have been addressed separately. “It feels different from retail perspective,” she said. In Vineyard Haven no businesses have applied for an extension yet, though Menemsha Blues did call to ask what to do about 10,000 plastic bags, said town health agent Maura Valley. “I told them they could apply for an extension,” she said. The business community has not been surprised by the upcoming ban, Ms. Valley added, though there have been some grumblings about the cost of stocking bags that meet the requirements of the ban. In the new year, Ms. Valley plans to do compliance checks and work with any businesses having difficultly meeting the new regulations. Sarah York, president of the Tisbury Business Association and general manager at CB Stark, said that none of the business association members have had issues with the upcoming ban. Ms. Look has been coming to the meetings, providing information about bag providers that sell bags that meet the regulations, she said. “VCS has been great at helping the businesses become compliant,” she said. Ms. Look said VCS has also turned its attention to educating shoppers, including day trippers and weekend visitors. Ideas like stocking reusable bags in rental houses, increasing awareness through pamphlets and hosting more bring-your-own-bag events in the summer are all being considered. Though the transition so far has been smooth, no one expects all plastic bags in the participating towns to disappear on Jan. 1. “If you walked around store to store to store, you won’t see every bag is perfect,” said Ms. Look. We do not have a comprehensive recycling plan on island but are focusing on plastic bags? Where else would residents have to pay to recycle? Thay does nothing to promote island-wide conservation. Recycling is difficult when it should be easy. Look at what other towns around the state do in their successful efforts. So, provide reusable bags for renters to bring to the supermarket. But let the renters put paper, plastic and glass in the same garbage bag? Be careful if you use one of those reusable cloth bags you see many people carrying around. Something that a lot of people do not know is that if it's made in China there is a strong possibility it is laced with lead. If you use that type of bag, try to get one that was made in the good ole U S of A.
I can't resist, the USA has one of the lowest recycling rates in the developed world. If you go to countries that have very high recycling rates, Germany, Japan, Korea, you will see single use plastic bags used almost everywhere. All of these societies have well thought out recycling strategies with high levels of compliance. The island and state need a comprehensive recycling policy and strategy before starting is piecemeal approach to what I don't know. Simple question, how many people know how many bags they will need when they go to the grocery store? How much vacation shopping is spontaneous? Do our merchants need to focus on this as their top priority? Looks too much like ready, fire, aim to me. Let's start with some benchmarking and a real plan. So I will have to use paper bags but then throw them in my garbage because there is no recycling done where I live. Super smart and productive. In DC there has been a plastic bag tax of 5 cents since 2010 but not an outright ban. DC used a catchy slogan "Skip the Bag, Save the River" to roll out the program in an attempt to help clean up the Anacostia River, "a waterway notorious for its toxic history and cringe-worthy pollutants" according to a Washington Post article in May 2015. The fee has raised about $10M since 2010 although an auditor's report in Oct 2014 showed that only about a third of the money raised actually went to trash traps, rain barrels and rain gardens to reduce toxic runoff, green roofs, tree plantings and stream restoration. However, the main goal was to begin to change people's behavior habits and it seems to be working. Although just over 40% of the funds were spent for salaries for people working on recycling projects the Post article notes that operating the program requires people and "boots on the ground". As part of the 2017 New Year a Styrofoam ban goes into effect in DC and many takeout restaurants and delis have already changed over to compostable containers. Each step may be small and certainly increasing the amount of recyclables is important but every step taken is helping. In DC there is a Zero Waste Plan with a 2032 deadline and motivated citizens are making changes in their neighborhoods showing that "Think Globally, Act Locally" (Rene Dubos 1972) really works. So my question is: "If DC, with a lot more people can make changes what is stopping MV especially since MV overall has a higher education level and a lot more money from its summer residents?" Perhaps this winter should be spent figuring out a marketing campaign to engage year-round residents, summer residents, renters, and tourists on what they can do to reduce their impact on the environment. People want to do the right thing to help save the Planet they just need to be shown how. Perhaps the different groups on the Island can create an overall group aimed at increasing recycling, reducing runoff, improving natural habitats, etc. What will be your answer when your grandchildren ask you "What did you do to help save the Planet?"